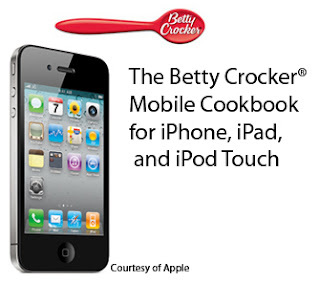 Leave it to the ole standby, Betty Crocker® to come up with a super-nifty app for iPhone, iPad, and iPod Touch and the good news is…its free! Yes! My favorite four-letter word…FREE! Recipe Search: Search for a favorite dish. There it is! Ingredient Search: Do you have too many canned tomatoes in the cupboard? Do an ingredient search and find a recipe that includes the ingredients you specify. Recipe Email: Send the recipe to yourself or a friend. Favorites: Save your favorite recipes for later access. Coupons: Receive mobile coupons for your favorite General Mills® products. Use your mobile handset to show the cashier the coupon. The cashier will scan the barcode shown. For more info visit Betty Crocker. The Betty Crocker Mobile Cookbook app is available at the Apple iTunes AppStore.